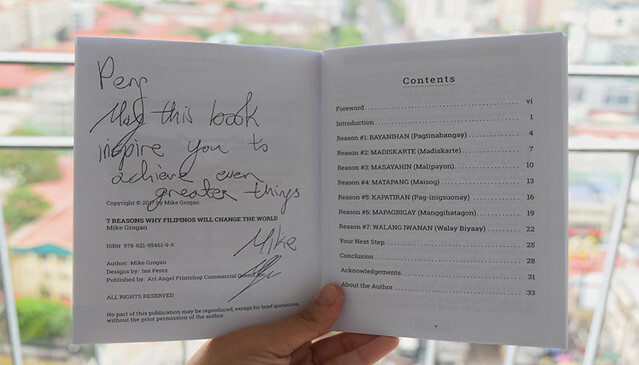 Mike Grogan, best-selling author of ‘The Rise of the Pinoy’ has yet again released another book entitled 7 Reasons Why Filipinos Will Change The World. Mike is an Irish man who fell in love with the Philippines and its people. When I received the book in the mail, the title alone took me by surprise. A book about Filipinos which is written by a non-Filipino? 7 Reasons Why Filipinos Will Change The World lists down seven characteristics innate to our nationality which the author believes make us the game changer in today’s broken world. I wouldn’t write here the seven characteristics as I want to preserve the mystery of the book so that when you finally read it, you’ll feel the magic I felt upon discovering them. This book made me feel good about being a Filipino. The seven reasons he stated on the book were mere actions we do every day, and we don’t even feel there’s anything special about them. But when they were presented in the book, I was like “Oo nga noh?” (Yes, indeed). I know I’m being too vague here. I’m really trying to keep the mystery of the book. But to give you an example, Mike stressed that one of the seven reasons is our “Bayanihan” (Communal Unity/Cooperation) and the example that he gave to prove this? Passing one’s jeepney fare from person to person until it reaches the jeepney driver. Hey, did I just hear another “Oo nga noh”? I finished mine in 20 minutes. It was so engaging. Enough said. And yes, it did just that. The book’s foreword was written by Gawad Kalinga Founder Tony Meloto and I personally find it too long (Sorry Sir!). I almost put down the book because of it. They were too much information and some went away from the foreword’s purpose of introducing the book. 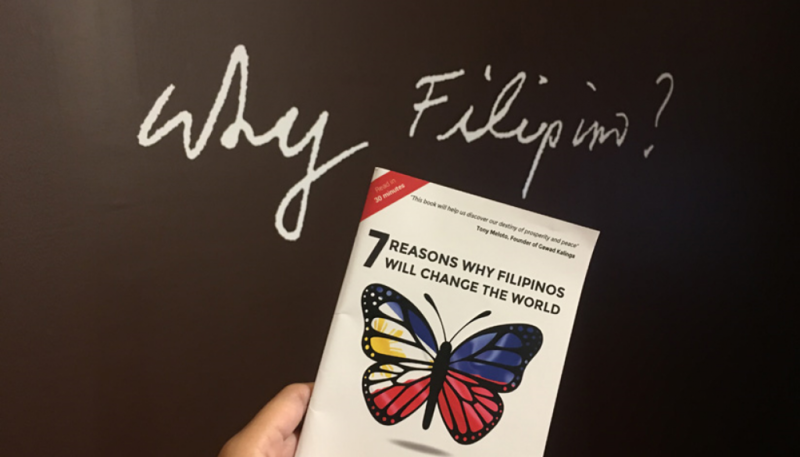 7 Reasons Why Filipinos Will Change The World deserves a slot in every Filipinos’ reading list. The Filipino character of being self-critical: always finding fault in oneself or our fellowmen (Maxine Medina’s Miss Universe feat, General Antonio Luna’s execution) is really beyond me. It’s unbelievable that we need an outsider like Mike to pinpoint how great as a nation we actually are. I hope this review makes you to bring out PHP 100 from your wallet and head out to the nearest National Book Store or Fully Booked outlet near you.